If you have any further questions, have a look at the frequently asked questions. If you still haven’t found the answer to your question, feel free to contact us via email or give us a call at +31 30 303 6300. Does Mother Goose serve breakfast? Yes, of course! But wilful as she is, Mother Goose does not serve the 'average breakfast buffet'. Instead, breakfast is served at Daens Café which is ideally located across the street, at 50 meters from Mother Goose. At your request, we can also serve breakfast in your room. Please feel free to ask about the possibilities. However, should you wish to enjoy a 'hotel breakfast buffet', our sister hotel Court Hotel happily welcomes Mother Goose's guests at the breakfast table. These are just the requests Mother Goose likes! We absolutely love to arrange something special for you, and without any false modesty, we must say that we are pretty good at it too. No request is too crazy. Dining on top of the Dom Tower? We will try to arrange it for you! So please, do not hesitate to contact us. Does Mother Goose have its own restaurant? Unfortunately, Mother Goose does not have a restaurant. However, because of its perfect location, Mother Goose is surrounded by Utrecht's finest restaurants. We are happy to advise you and make reservations. Are photoshoots and film tapings allowed at Mother Goose? Mother Goose is very popular as a photoshoot and film location. Would you like to have a photoshoot or film at Mother Goose other than for private use? This is only possible with the explicit consent of Mother Goose. Contact us at welcome@mothergoosehotel.com to inform about the possibilities. When can I check in to Mother Goose, and when do I check out? From 15:00 onwards, Mother Goose will take you under her wing until the moment you check out. Don't worry - you have until 12:00 to wake up slowly, and start your day. Our reception staff is at your service 24 hours a day, so you are more than welcome to check in late or check out early. It goes without saying that you are very welcome to leave your luggage with Mother Goose before check-in and after check-out, so you can discover Utrecht light as a feather! Do the rooms have a minibar? No, unfortunately there is no minibar in the rooms. But the Mother Goose living room does have a huge SMEG fridge with an extensive selection of cold drinks. Of course, we also have sweet and savoury snacks available. Does Mother Goose have gift vouchers? We certainly do! Looking for a unique and original present? We would love to help you out. Our gift vouchers are great to give and great to get as a present! Does Mother Goose Hotel offer a bike rental service? Yes, we do! Utrecht is often called ‘bike city’, so do what locals do and discover the city by bike! I would like to get an airport pickup. What are the possibilities? Mother Goose offers two options for an airport pickup: a regular taxi or a Tesla Cab. From and to the airport Mother Goose works with Tesla Cabs. Your journey from door to door will be in an electric Tesla, where you'll enjoy all the luxury the Tesla offers. A table for your laptop, a bottle of water and wifi guarantee a smooth ride for you to enjoy the view or answer some e-mails. Exclusively for Utrecht City Hotels guests, there is a special fee of € 109. Please let us know if we can make a reservation for you. Would you prefer a regular taxi? We can take care of that reservation as well. When is a reservation a group reservation? A reservation is a group reservation when it has 5 or more rooms. The best way to book these reservations is through e-mail; welcome@utrechtcityhotels.com The easiest way to cancel your reservation is to call the front office. Does Mother Goose have meeting rooms? Mother Goose is proud to announce that within its Utrecht City Concepts family, it offers meeting facilities through Utrecht City Meetings, which boasts 10 meeting spaces and many food and beverage possibilities for a successful meeting. Would you like to know more about Utrecht City Meetings and what we can do for you? Click here or call our Event Executives for more information at +31 30 233 0033. Does Mother Goose offer gym facilities? Mother Goose works with TrainMore to offer our guests excellent exercising facilities during their stay. With a large assortment of equipment, personal training, live classes and a sauna, TrainMore is a luxury, fully equipped gym, at only 3 minutes from the hotel on foot. Upon presentation of their hotel room key guests can make use of the special Mother Goose rate. Does Mother Goose offer rooms accessible to individuals with disabilities? Because Mother Goose has taken up residency in an ancient and monumental building, it was almost impossible to realise specially adapted rooms and facilities. The many stairs and beams are unique and very beautiful, but unfortunately it makes the hotel less suitable for disabled people. But please do not hesitate to contact us about the possibilities, because Mother Goose’s sister, the Court Hotel, does have specially adapted rooms. We would be pleased to help you. I have problems walking, are all rooms accessible by lift? Several of our rooms can be reached by lift, so that you do not need to use the stairs. Ask us about the availability of these rooms, Mother Goose will be pleased to give you personal advice. Are pets allowed in Mother Goose? No, unfortunately pets are not allowed in Mother Goose. We would like to stay at the hotel with 1 baby (younger than 2 years), is this possible? But of course! We would be more than happy to put a cot (free of charge) in the Large Mother Goose and in our suites! Because we have a limited number of cots, we can only do this on basis of availability. So please, let Mother Goose know in advance, so she can make sure your baby has everything he or she needs. We would like to stay at Mother Goose with our family, is this possible? Yes, of course it is! 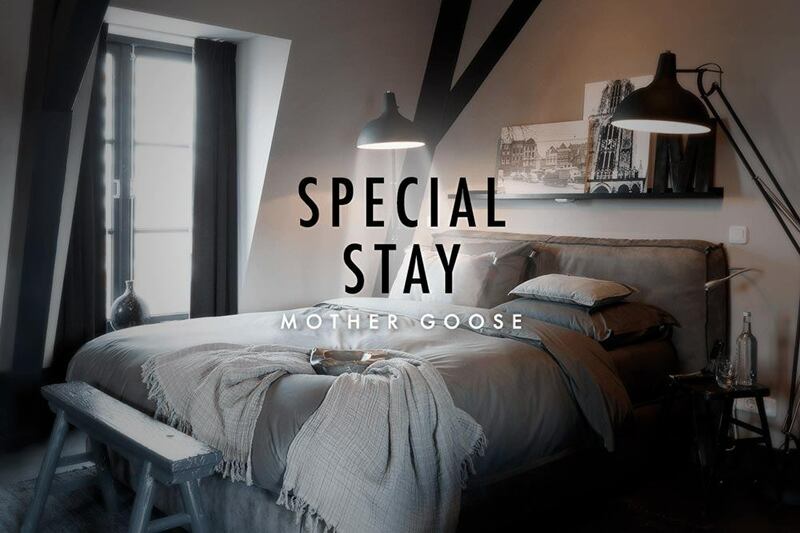 With our family guests in mind Mother Goose offers a Goose Family Room, consisting of two Large Goose Rooms with a connecting door. This way, parents and children keep their privacy but can still stay at our hotel together! Bookings for these rooms are only upon consultation with Mother Goose. Please contact her for more information. When booking a room, can I be sure that my preferences are acknowledged? Can I indicate in advance which floor has my preference? Of course you can let us know in advance on which floor you prefer to stay. Mother Goose will do her utmost to honour your request, but we cannot guarantee you will end up on the floor you have requested. Why does the room I’d like to book have different prices per night? Mother Goose works with a best available price per night and therefore it can happen that the same room has a different price each night.